President Duterte, Defense Secretary Delfin Lorenzana and AFP chief Gen. Eduardo Año inspect Kalashnikov rifles from Russia during a turnover ceremony at Pier 15 in Manila yesterday. Also in photo are Foreign Affairs Secretary Alan Peter Cayetano (left) and Russian Defense Minister Sergei Shoigu (right). MANILA, Philippines — Russia yesterday turned over trucks, rifles and other military equipment to the Philippines as the two countries moved to further enhance nascent defense ties with the signing of an agreement on defense and technical cooperation. 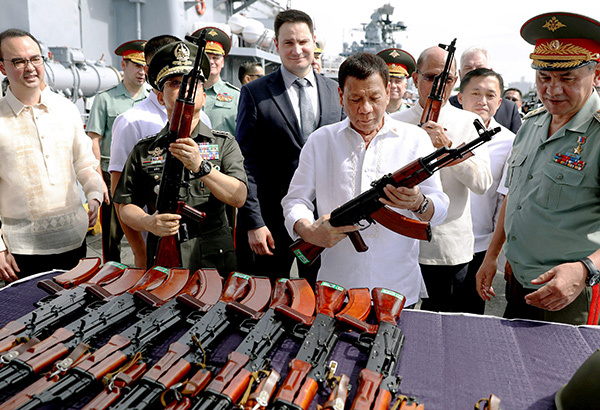 President Duterte witnessed the handover of 20 Ural-4320 multi-purpose vehicles, 5,000 AK-74M Kalashnikov assault rifles, one million 1943-type cartridges with steel core bullets and 5,000 steel helmets at Pier 15 in Manila. Duterte did not deliver a speech during the event, but was seen thanking Russian officials for the donation. The turnover happened a day after the Philippines and Russia signed an agreement on military and technical cooperation. The agreement was inked on the sidelines of a meeting of defense ministers from the Association of Southeast Asian Nations (ASEAN) and their dialogue partners in Clark, Pampanga. Defense Secretary Delfin Lorenzana and Russian counterpart General Sergey Shoygu signed the agreement on Tuesday. “The document contained provisions on various areas of military and technical cooperation such as research, production support, as well as possible exchange of experts and training of personnel for joint programs,” defense spokesman Arsenio Andolong said in a press statement. The two governments also signed a contract for the Philippines’ procurement of defense articles from Rosoboronexport, a Russian state-owned company. Lorenzana and Rosoboronexport director-general Alexander Mikheev inked the agreement, Andolong said. Russia’s defense ministry director Maj. Gen. Aleksandr Kshimovskiy and Philippine defense undersecretary Raymundo Elefante signed the certificate of donation for the arms and equipment unloaded at Pier 15 yesterday. Earlier this month, Lorenzana said the military equipment from Russia would be used to fight terrorism. “They want to help us fight terrorism. They are also fighting terrorism in their country and they also want to fight the worldwide fight against terrorism. That’s their reason,” the defense chief said in an earlier interview. Lorenzana said the Philippines is open to holding joint military drills with Russia. “Maybe… in the future but we do not have an agreement for that. But they said that if there is no agreement yet, they can come here and we can send our troops there, maybe small groups… first to observe their exercises and later on participate,” he said. Elefante said that with the latest agreement, procurement of disaster and military equipment from Russia would likely be finalized within the year. Except for military trucks and helicopters, Elefante did not specify what other defense equipment would be procured from Russia. “It’s the extension of defense cooperation that eventually will pave the way (for Manila) to have these military equipment if we are going to acquire them,” Elefante only said. Before the turnover ceremony, Duterte boarded the anti-submarine ship Admiral Pantaleev docked at Pier 15 at the Port of Manila. He toured the shipboard main alley, air defense platform, main artillery unit and wardroom. It was the third time Duterte toured a visiting Russian ship. The President visited the Russian guided missile cruiser Varyag in April and the Russian large anti-submarine ship Admiral Tributs in January. He made an official visit to Russia last May but was forced to cut it short because of the Marawi siege. An official of IBON Foundation said the think-tank’s website was hit by a cyber attack.